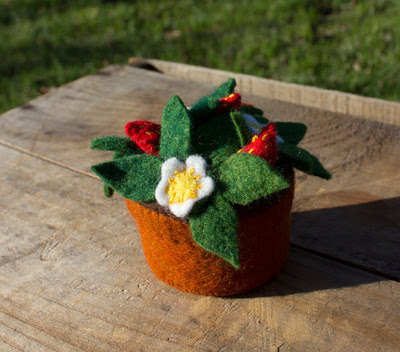 I am the featured artist of July's Common Thread Give-Away and have decided that since it is strawberry season here in Vermont, I will be giving away a small potted strawberry plant pincushion/decoration. It is made of felted wool with delicate detailed strawberries, along with their lovely white flowers--all hand-stitched. I love making my own little flowers and plants, and seem to be able to keep them green and blooming, unlike real ones! 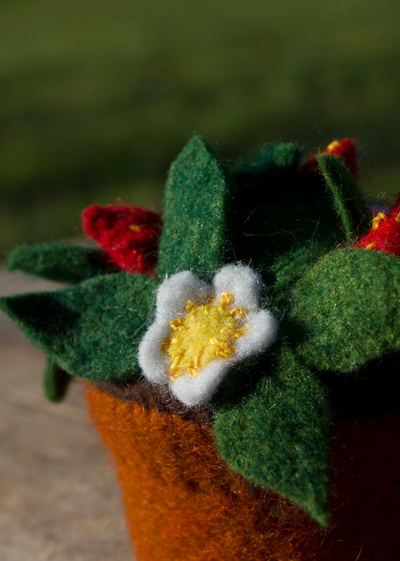 You may use your little potted strawberry plant as a tiny pincushion, or simply as a decoration. All you have to do to win, is to leave a comment Monday through Wednesday, July 1st-3rd, along with your email address. A name will be randomly drawn from all who registered July 4th and the winner announced that same day. You will be notified by email and need not be by your computer that day. In fact I hope you will be out celebrating this holiday and be surprised when you open your email! Do visit my ETSY store by simply clicking on ETSY on the right hand side of my blog. Good Luck and thank you for visiting my blog and store! P.S. I have just posted my wool, Ozark, doorstop hens. You may want to adopt one now before they are gone. Be sure to read to see which one fits your color decor, name and/or personality. Each comes with its own Hatch Certificate to certify that it is made here at Little House by me and all are easy to care for, unlike real ones!